Love is therapeutic, love is beneficial to your physical and emotional health. Read along to know the 5 Health Benefits of Love. It is the month of love and everyone in my timeline and everywhere around the world is going crazy over the four letters right now. I am too – but in a little different way. The idea of being in love, feeling the love of a man or woman, the nuances of love, hearts and flowers everything sounds mushy and romantic. But did you know there could be health benefits of love as well? Love, as the Oxford Dictionary says is ‘A strong feeling of affection’. Love can be between anything or anybody. It doesn’t have to follow a set pattern – though people do follow the set pattern! Love is hope, love is trust, love is happiness. Love is also therapeutic, love keeps your physical and mental health good. And it’s not just me who’s saying it – science has been. No, I am not talking about emotional healing here. Science says, when we touch people we care about the body releases Oxytocin, which is also famous as the ‘love hormone’. Oxytocin helps us reduce stress, helps women in childbirth and breast feeding, it improves social skills in humans. The more you have a loving connection with someone or with friends, the more you produce Oxytocin. Studies have shown a higher level of oxytocin can reduce pains like headaches, cramps, body aches. Isn’t that awesome? Heart knows what is right, always! A study in the journal Psychosomatic Medicine says people who hung out with their loved ones and close friends had a lower blood pressure level than people who hung out with strangers. The main reason behind this is the emotional support and bonding you get from your partner – where you talk less and feel more. Loneliness in aging adults is also a major factor in increased blood pressure levels. The lonelier you are the higher the blood pressure. So hang out more with your partner, close friends, family – everyone that you love! When you are in love and have a steady relationship it is less likely you will get into a depression and consequently keep yourself away from substance abuse. A good marriage reduces depression and it also contributes to the decline of alcohol or substance abuse. You find more people abusing substance and consuming alcohol when their relationship is not working. According to studies holding hands calms your nerves. High stress and anxiety can result in high blood pressure, increased heart rates. When you have your loved ones nearby holding hands it calms your nerves. Love prevents individuals into getting into clinical depression. People who have successful long-term relationships are happier souls and they practice generosity. They are more patient and live in gratitude. This reminds me of an old Beatles song “I just need someone to love.” With such a powerful feeling in itself, we all need to love. It is rewarding, it is wellness, it is a way of life. Readers, here’s me wishing you love, happiness and health. Isnt that cool! Love..to stay happy and healthy. I should take a large dose of love for that backache :-). But on a serious note, this is true. Our body releases “feel-good” hormones such as oxytocin, endorphines, dopamine etc when we express love in some form. We need more love and compassion in this world. Love is a feeling that can heal broken and hurt… Lovely post Tina… Wish you a fabulous day. The healing powers of love are so many. It’s sad when love is made out to be just the romantic kind and that too involving heartache. Love is so much more. 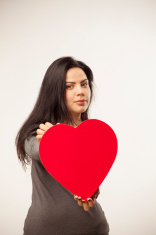 Wishing that love right back at you, especially now knowing the health benefits. Love has its own untold benefits. Thanks for this interesting and informative insights. Love is beautiful. And see you have got health benefits too. Very informative and ‘love’ filled post. That’s a really nice post. Love is so much more than just that the usual guy meets girl romantic kinds. It surely provides reasons to stay happy and healthy :). Aseem Rastogi recently posted…100 word fiction: The wax figures..
WOW. Great informative post on love. hope everyone at least loved ounce in there life. life make people happy joy and a stronger feel to each either. when i was in my college days, i to loved a girl and we are committed to each other but completing graduation we broke up. because of her family problem. i agree with you, really love give very positive vibe and good energy to health. love is like meds pill to life . Thanku for sharing with us. hope you a doing well this days. The direct correlation between mental health versus emotional health is a bit like talking about apples and oranges. While they might both appear to be identical, they are not actually the same thing at all. Most people would tend to describe themselves as either an intellectual person or a more emotional person. A healthy individual would say they are balance of both. Often we take little notice of the phenomenal things that surround us everyday. Birds, bees, flowers and trees work in harmony to make nature’s gold. Raw honey is more than a sandwich filler, it’s a wonder drug. Great tips I have noted all in my diary I’ll use your all tips as you mentioned I really like your article I was searching on health tips as I’m working on health topics as Healthy Information you can see my work but yours is too good I personally appreciate you for this. Keep working like this.